I’ve writ little of late. My niece was fire-hot for her lessons, and that kept me occupied. Then she disappeared. Gone to find a handsome stone-cat or two that might occupy her. Or so I believe. Such is the way of the world. I went to the Cat’s Field, but did not see her there. Linkin gave newes. He sayt Her Majestie was wearie of the Earl of Essicks [Essex], and had showed our Earl some favour. Linkin oft knows newes from London. He hears it from his mistress, whose son dwells there. But I knew more of this than Linkin did. True, Her Majestie was most kind to my lord. Then she offered him an insult. My lord went to hand her to her horse, and she disdained him before all. He was so shamed he had no choice but to quit her household. He’s back there now, but I do not think he will forgive her. Nor would I. 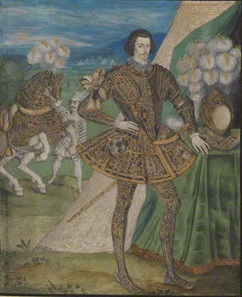 The Earl of Essex (and his horse) dressed for jousting. My lord never wisht to take the place of Essicks, who is his friend. But the truth is, our Earl and his friends must strive to please the old Queen, because they can do nowt without she say so. Should they wish to marry, travel over sea for their education, or join an expedition to have at the Spanish or some other enemie, they must seek her permission. And she loves to say, No. The other cats could scarce believe their ears when I told of this. At our next meeting I gave newes of the great celebration that is held every year to mark the day Her Majestie first took her place. 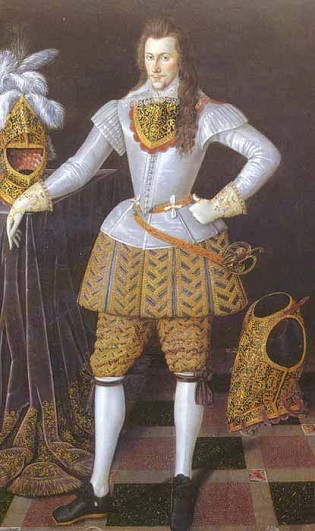 The Queen’s Champion: George Clifford, 3rd Earl of Cumberland (1558-1605) – by Nicholas Hilliard. All love a celebration, even if they no longer love the reason for it. Many lords and horses don fine armour and make a great show of theirselves. Play-fighting, that they call the just [joust]. My lord rode in the just as Bevis of Southampton. A great screech went up then. All hereabouts know the tale of Bevis, and what an evil woman his mother was. They begged to hear some scandal about our Earl’s mother, the Countess. I would not tell any. True, I have slandered our Countess in my poetick fictions, but she was a good wife to her second husband, who died not long since. “She poisoned him!” came a call. 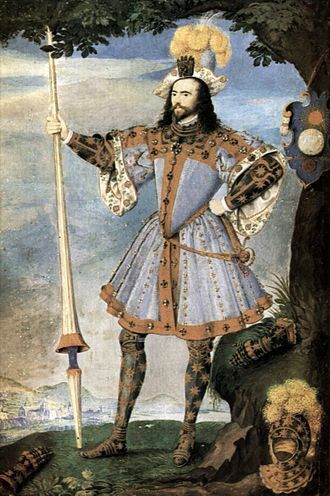 Gib’s lord, the Earl of Southampton, with armour. Artist unknown; probably painted c1599. But, as all wisht to hear something to make them merrie, I sayt, “Friends, when last my lord was here I caught a scent of queen about him. “I do not mean a queen-cat, nor Her Majestie. I mean a young woman. It was not his sister, Lady Moll. This was a woman I do not know. Linkin thought this woman’s name might be Puss Fur-None [Bess Vernon], but he could not swear to it. And we arrkst ourselves if that was why the Queen had snibbed our Earl. Gib probably wrote this at the end of 1595. The Earl of Southampton turned 22 in October that year. He was briefly tipped by court gossips to become Queen Elizabeth’s new favourite. She may have been growing weary of the sulks and self-promotion of the brilliant but erratic Earl of Essex. It was also around this time that she found out that four years earlier, Essex had had an affair with one of her maids-of-honour, who’d given birth to a son. Perhaps Queen Elizabeth was using Southampton to show Essex he was disposable? A tricky situation for Southampton, who wouldn’t have wanted to annoy either Essex or the Queen. The annual celebration Gib refers to is Accession Day on 17 November, when an elaborate display of jousting was put on. The poet and playwright George Peele wrote an account of the 1595 occasion in Anglorum Feriae: England’s Holidays. Puss Fur-None, better known as Elizabeth Vernon (1573-1655?) was Essex’s cousin, and another of Queen Elizabeth’s maids-of-honour. Southampton’s interest in “the faire Mistress Vernon” was court gossip by September 1595. The Queen wouldn’t have approved. Her maids-of-honour were the most junior of her well-born female attendants, and they were there to learn courtly ways. She may have resented their flirtations (sometimes innocent, sometimes not) with her male courtiers. More importantly, the Queen – as that rare being, an unmarried woman ruler – had also to consider the reputation of her household along with her own reputation.